Gulf Coast States Get Creative With BP Oil Spill Money Oil giant BP has agreed to pay $1 billion for coastal restoration along the Gulf of Mexico because of the 2010 oil spill. But the nature of some of the projects, including boat ramps and a beachfront hotel, has some environmental groups raising questions about what counts as coastal restoration. 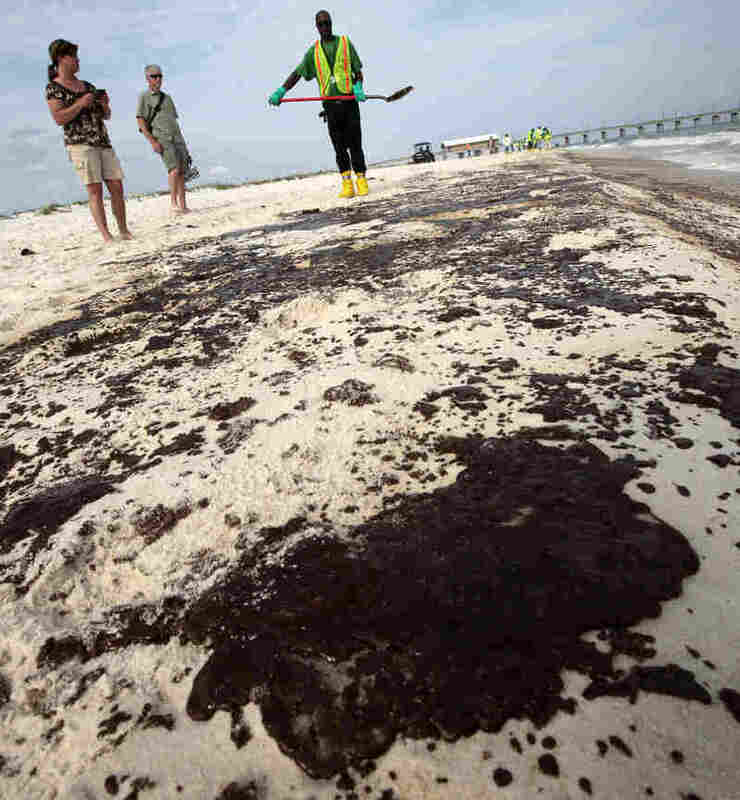 Tourists watch as workers clean oil from the sand along a strip of oil that washed up on the beach in Gulf Shores, Ala., in 2010 after the Deepwater Horizon oil rig exploded off the Louisiana coast. Gulf Coast states are lining up to spend $1 billion from BP on coastal restoration. The money is part of BP's legal responsibility to restore the Gulf of Mexico's natural resources in the aftermath of the worst oil disaster in U.S. history. 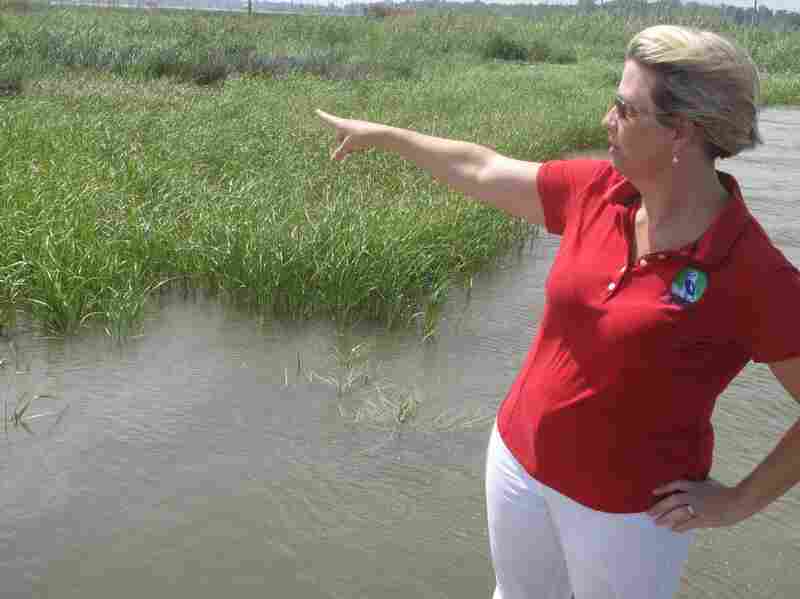 But the nature of some of the state projects, including boat ramps and a beachfront hotel, is raising questions about just what counts as coastal restoration. Earlier this month, Alabama's Gov. Robert Bentley stood on a sugar white state park beach to announce plans for an $85 million lodge and conference center. The event had all the trappings of an economic development announcement. State lawmakers, local mayors and business owners were all smiles to hear that the Legislature had finally, after years of stalemate, given the go-ahead for a hotel on state park property near Gulf Shores, Ala. The state can contract with private companies to build and run the facility. What pushed the hotel through this year, as noted by Lt. Gov. Kay Ivey, is that BP is footing the bill. "Without costing the taxpayers a dime," Ivey said at the announcement earlier this month. All five Gulf states are sharing in the $1 billion from BP. It's a down payment on what the oil giant will be forced to pay under a lengthy process called Natural Resources Damage Assessment, intended to restore the Gulf ecosystem to the condition it was in before the 2010 oil spill. Bentley said improving the beachfront state park achieves that. "The lodge and the meeting facility are part of an overall effort to strengthen the Gulf Coast and our natural environment," Bentley said. The first round of plans from Texas to Florida includes barrier island restoration, artificial reefs, science and education centers, boat ramps and boardwalks. It's not unusual that states are lining up projects that don't directly restore the environment, says Seattle attorney Valerie Lee, president of Environment International, a firm that specializes in NRDA. "Some of the projects are like coral reefs — you had problems with injury to coral reefs. But you also see things like visitors centers. How on earth could a building repair the environment? Well, it's not directly repairing the environment," Lee says. "What it is doing is compensating for the recreational loss uses — human uses that are associated with a quality Gulf." But Lee says the Alabama beach hotel might be a stretch. "That to me is not providing a public use and a public benefit if indeed you are actually charging the public for a hotel room," she says. Alabama officials argue the public couldn't use the beach when it was soiled with oil, and now, a new hotel will attract people back to the Gulf Coast. Tony Kennon, mayor of Orange Beach, Ala., says it's a smart strategy to first seek human-use reparations, which he calls the low-hanging fruit in the damage assessment process. "A lot of the environmental projects are going to take more time to evaluate, to look at, to make sure that we're not cutting ourselves short by jumping in too soon and not asking for enough to fix the problem — whereas when it comes to loss of human use, which is where this money comes under, that's ready for us to grab right now," Kennon says. It could take years of assessment and negotiation to determine the ultimate damage to the Gulf and what BP should pay to repair it, a figure likely to be in the billions. In the meantime, environmental groups want to see early investment in building a more resilient ecosystem — projects like an oyster reef on the breezy western shore of Mobile Bay, the very first environmental restoration project done in the aftermath of the BP oil disaster. Casi Callaway, director of Mobile Baykeeper, says two years ago, about 600 volunteers came to this waterfront park in Mobile to lay a quarter mile of oyster shell in the bay just off the shore. Callaway says the new oyster reef absorbs the wave energy from large ships that pass through Mobile Bay before it can reach land and erode the shore. "That enables the shoreline to build up behind it. That adds land. That is environmental restoration; it's property enhancement; it's better for insurance purposes, flooding, hurricanes, you name it," Callaway says. Technically, Callaway says, the state may be able to call a hotel restoration. But she says it makes her uneasy about how future monies to compensate for the BP oil spill might be allocated. "When the very first thing that's supposed to be environmental is going to an economic project, that's not OK," Callaway says. The early restoration plans have received the OK from BP, Gulf states and the Obama administration. The next step is public comment and review.